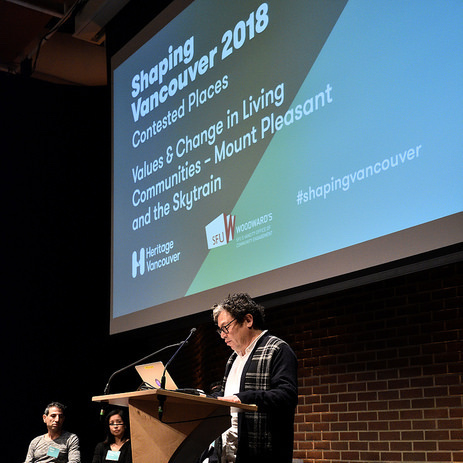 In this session of Shaping Vancouver, we focus on the recently-announced SkyTrain extension that will include a new station in the core of Mount Pleasant. This has provoked some fears that rising property taxes and increasing rent & maintenance costs will squeeze out “the hip, little village”, as well as drive dramatic new developments. With such a major infrastructure project on the horizon in Mount Pleasant–similar to previous transformations of the Cambie Corridor―the City will have to determine how the qualities definitive of Mount Pleasant can be protected and/or adapted due to this comprehensive land use change. 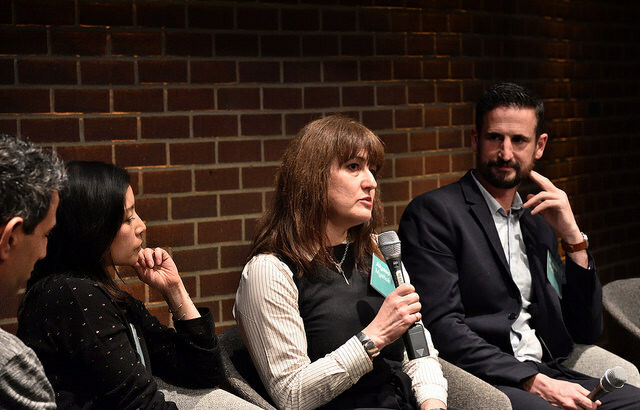 In this session, the panelists discussed a number of social priorities, including housing affordability, neighbourhood integration, the strength of the Corridor’s job market, and the unique cultural fabric of Mount Pleasant. The recently-announced SkyTrain extension will cut directly through the Mount Pleasant neighbourhood, which stretches from Cambie Street to Clark Drive along the Broadway Corridor. The junction where Main Street and Kingsway converge is the historic and cultural heart of this area, lined with pedestrian-friendly streets, independent stores and cafes, and a village atmosphere courtesy of affordable rental apartments, historic architecture, and independent businesses. Planners, developers, and policymakers in Vancouver have spent decades debating the improvement of the rapid transit network along the Broadway Corridor. As the City starts the planning process, it has an opportunity to address a number of different social priorities, including housing affordability, neighbourhood integration, the strength of the Corridor’s job market, and the unique cultural fabric of Mount Pleasant. 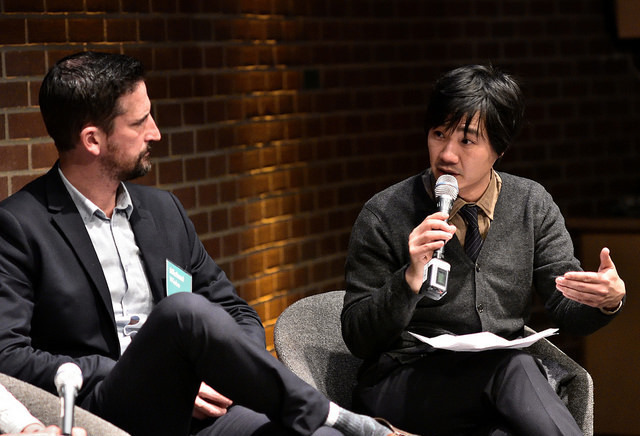 Moderator Bill Yuen opened the discussion by explaining that heritage seeks to understand what is of value to people. This includes a wide range of values, and is not only concerned with old buildings, but links spatial issues with social issues and lived experiences. This way of thinkings allows us to be aware of the secondary effects that are incurred when we make interventions into our environment. With regards to the upcoming city-wide plan, Bill Yuen believes that rather than focusing on just the constituent parts of a neighbourhood, we should instead focus on the relationships that people have with those parts within that environment. In this discussion we focus on Mount Pleasant in relation to the Broadway Plan, which was approved by City Council earlier in the year. 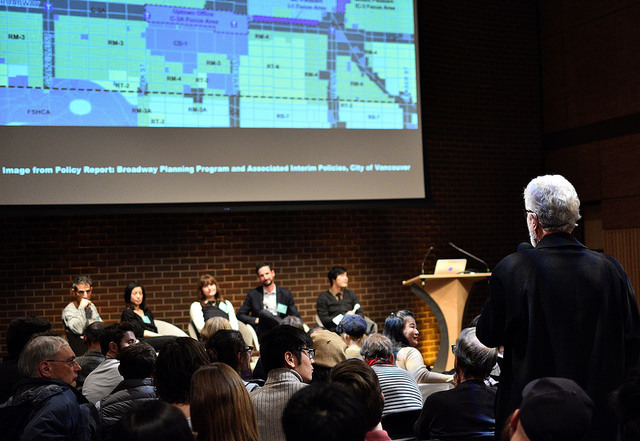 According to John Grottenberg of the City of Vancouver’s Broadway Corridor Planning Team, the intent of the Broadway Plan is to coordinate a comprehensive plan for the Broadway area through the delivery of new rapid transit within the framework of a plan with land use, job space, affordable housing, park and public space, art, culture, heritage, and public amenities. With the adoption of the ‘Terms of Reference Document‘ rezoning will generally not be considered in Mount Pleasant until the two-year planning process is seen through. 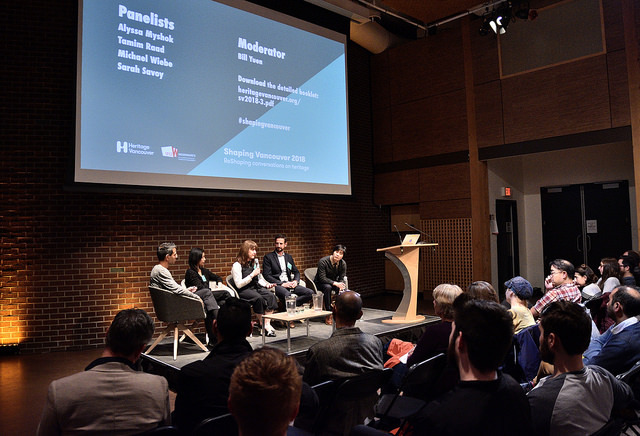 At Heritage Vancouver we believe in the importance of the public sphere, and as such we believe that it is valuable to expose everyone participating in the decision-making process to a diversity of perspectives to help them make judgements while planning our city. To those participating in the upcoming planning process, we hope that this talk gives you something to think about regarding heritage. Sarah Savoy moved to Mount Pleasant to open her business, Much & Little, after a long research and planning process. She believed that Mount Pleasant was the right neighbourhood for her because of its particular identity. She describes it as an “energy of creativity” and as “a neighbourhood with a soul” that she wanted to be a part of. Tamim Raad jumped in and said that Main Street has an incredible diversity of people and businesses within walking distance that is hard to find, and the reason that he moved into the neighbourhood in 1995. To him, Mount Pleasant represents a “confluence” of all of Vancouver. Councillor Micheal Wiebe explained that “What we liked about Mount Pleasant was that feeling that it was a complete community, and we feel that that is a little threatened now.” He went on to say that there is a feeling among small business owners that they do not have long-term security. People are not as able to reinvest in their business because they feel nervous about their longevity. While there have been scares in the past of dramatic changes to the neighbourhood, people are now especially nervous that development could take away the unique feeling that everybody loves about Mount Pleasant. Will the new developments come with a Tim Hortons, or will Mount Pleasant still host the beloved independent shops that have great history? People are asking themselves if they want to fight to stay in the neighbourhood if the costs are rising and the character that they love is being lost. Sarah Savoy responded by explaining that “it’s hard to talk about this without talking about affordability.” A year ago, her rents rose 80% but she truly wanted to stay in the neighbourhood, and so recently had to move her shop to a new location where she only has half the space. Sarah went on the say that “gentrification is not necessarily a bad thing, but a certain degree of change is inevitable. She went on to explain, “When I moved in in the 2000s, I was part of a wave of gentrification at the time.” But at this point, she says that there is definitely a sense of unease in the neighbourhood and everyone has a possible exit plan. Councillor Wiebe reflected on his time with the Mount Pleasant Implementation Plan, where a number of community members met to decide where they as a community felt that their neighbourhood could densify. At their meetings, they singled out three locations where they thought they could put in high rises without disturbing the character of the neighbourhood. This plan, according to the Councillor, was incredible because it showed a community coming together to propose positive changes and developments that worked with Mount Pleasant’s identity. However, the plan was shut down and in the overall view of the participants from the community, the consultation didn’t matter because they weren’t heard after they had put so much effort in. Alyssa Myshok then questioned the approach that is often taken to development (33:25). “What if we flipped this approach. We should keep our Main Street at human scale, let’s keep the walkability, let’s keep the appeal. What happens if we go in to these single-family [neighbourhoods] and rethink the zoning. We keep building on the same plan and ideas that are as old as the city, maybe we need to rethink where we are as a society and rewrite our approach completely.” In response, Tamim Raad said that as far as planning is concerned, we continue to build on a site by site basis but up until now any comprehensive vision from the city was absent, and there was no overarching vision that could be applied to a site- or corridor-scale. Adding on, Councillor Wiebe brought this back to his work with the Mount Pleasant Plan, where people began to recognize that there are give and takes, but they can keep the character that they want. Tamim Raad spoke to two different pressures that got in the way of dispersed densification. First, there is strong pressure on developers to maximize profit, by putting in as much density as possible. Second, the City faces pressure to put in as much density as possible to reduce automobile dependence and hopefully drive down housing costs. However, densification is often met with community resistance, which is why the City chooses to densify only where it is easiest, such as along jobs corridors. In European cities, density is often more evenly distributed, with many cities there being more dense than Vancouver but do not have the wild disparity in density between neighbourhoods that Vancouver does. This shows that density can take a number of different forms, and while European cities grew with even density organically over a longer time, it does show that there are a number of options in between single-family homes and high-rise towers. Rather than thinking about spreading out the impact of density, Tamim Raad believes that we should think about spreading out the benefits of density. 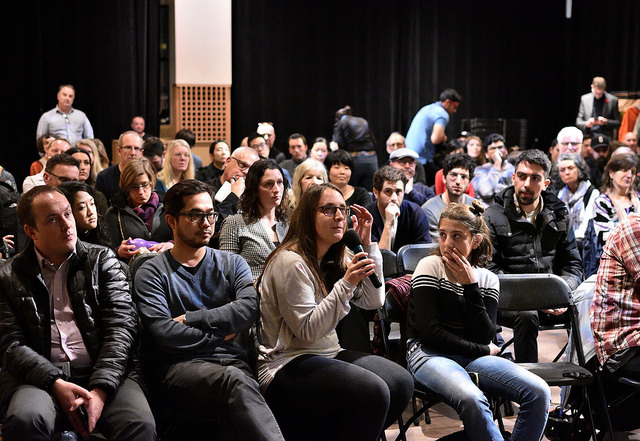 Tamim Raad responded by saying that we must be aware of the particular needs of the communities in question. He spoke about the Turner’s Dairy development application at 17th and Ontario that was greeted very negatively by the community because the City did not effectively consult with the residents, who had concerns over parking and traffic. Tamim Raad believes that they might have met less resistance if they had addressed the biggest issues head-on. Similarly, approving density will always be difficult if it is done in a piecemeal fashion, but could become easier if all development in the city was working towards a common city-wide vision. Going on, Tamim Raad spoke about how people often fear change but then get used to it when it occurs. This requires an ongoing dialogue, where neighbourhoods can increase density a certain amount, and then people see that when done smartly there is no harm to the neighbourhood character. We have already seen this happen with basement suites and laneway houses, and we are now at a tipping point where we can have a bigger discussion about introducing increased density into low-density neighbourhoods. Alyssa Myshok then added (46:21) that “we are sitting in a place that might not be here if people didn’t push back,” referring to the Woodwards building. 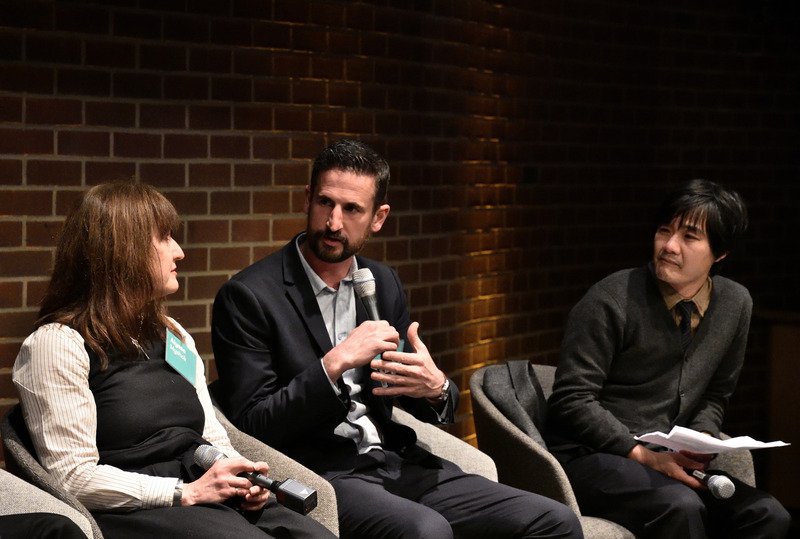 “The people who push back are not pushing back on density, but they want smart densification. The two aren’t incompatible.” Continuing, she said that “if we had the bravery to engage communities then we can start to get through to them. Through hearing all these stories, I see that many people came to see a way forward with new developments. Do you feel that more community engagement would help this kind of planning? Councillor Wiebe said “If we want to deliver good plans, we need to make sure that the community benefits come early. People want to see that you’re going to step up to your part of the deal. It seems that no one is talking about the elephant in the room–the Broadway subway. Once the subway comes in, everything that we've been talking about will be completely changed, and the type of transit that we choose will determine the built form of the entire city. Would you support an above-ground LRT system across the city? The form of Main Street is derived from the fact that it's an old streetcar suburb. Do you feel that this is an opportunity for innovation when these developments come through? Can we start to put commercial activity on residential streets? Councillor Wiebe also added “One of the things that we’re looking at in Mount Pleasant is a co-op on the Heritage Triangle to save the small business[es] there, and maybe also have some space open for artists’ studios.” Continuing, the Councillor remarked that at an Urbanarium, City Council looked at some really creative mixed-use spaces from Strathcona, but a lot of the cool, eclectic spaces that people love wouldn’t be approved if they were proposed right now. That’s because they’re having trouble with the permitting. I moved to Mount Pleasant in the early 90s, and it was very different then. The Mount Pleasant heritage that you're worried about is only from the past few years. I support the Broadway line. From the audience, Neil Wyles, Executive Director of the Mount Pleasant BIA, explained “we want to protect the things that made you move to Mount Pleasant. Some of the businesses have changed, but the buildings have not. Those buildings are under immense pressure to develop under their property taxes. Some businesses are paying twenty times the residential taxes … I use the term ‘starbuckification’, and we need to change the way that businesses along major arteries are taxed. They are being forced to sell and develop. To protect the reason why you moved to the neighbourhood, we need to maintain the social fabric before we reach a tipping point and become a strip mall. My question is about gentle densification. How do we think about densification for people who live in the neighbourhood now but are struggling or for those who want to move in but could never afford to? 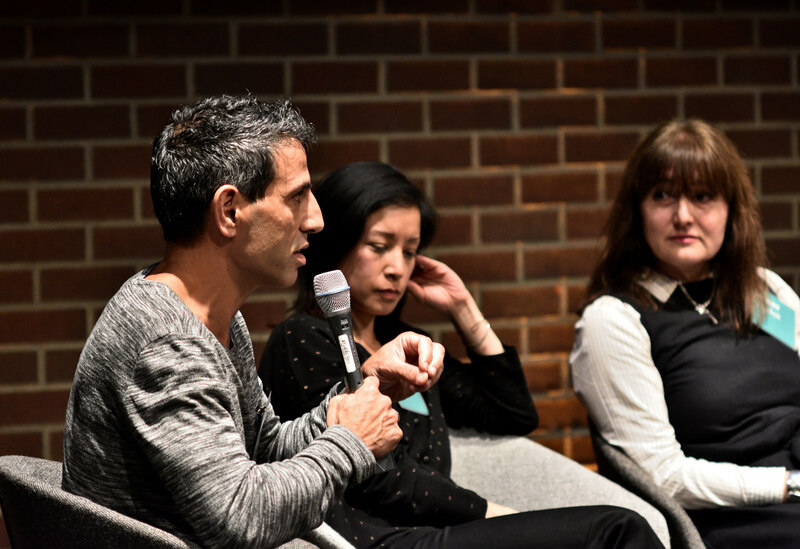 Tamim Raad responded to Sarah Savoy by saying “While we haven’t seen affordability get better with densification, the question is whether or not it would be a whole lot worse without densification. I think we all agree that with a fast-growing city, we need increased supply of homes. The problem is the rules by which densification is happening. It requires a concerted effort from the City to rethink how we manage the housing supply. How does the planning process ensure that young, transient, ineligible to vote, queer, and visible minority residents are heard? People are transient because they're priced out, is there intent of retention? From the back of the room, John Grottenberg from the City of Vancouver’s Broadway Corridor Planning Team also confirmed that anyone is welcome to participate in the planning process. Lastly, Tamim Raad noted that “The World looks really different when you’re looking at it from three feet hight. It’s important to talk to your kids and involve them in these conversations. Is there an overall planning coordination for transport projects between Vancouver and the other municipalities in Mount Pleasant? Regarding the idea of spreading density around–there is always pushback when you go into RT or single-family housing neighbourhoods. Densifying those neighbourhoods would be tough even with all the consultation in the world. How realistic is this model? With the [Broadway SkyTrain expansion] process being fairly long, how do you ensure that Mount Pleasant's character survives the construction period? Why is it that developers believe that they can only make a profit when they build tall towers? In Germany developers can build medium-rise buildings and still make very decent money. Why can't they do that here? Tamim Raad said “the general principle is that developers will want to maximize their revenue and put in as much density as possible, and it is up to the City to decide what is enough on certain sites. Sometimes it is okay to say that ‘this is the height that we’re going to allow, and it the current market conditions don’t support that then we’re willing to wait’. 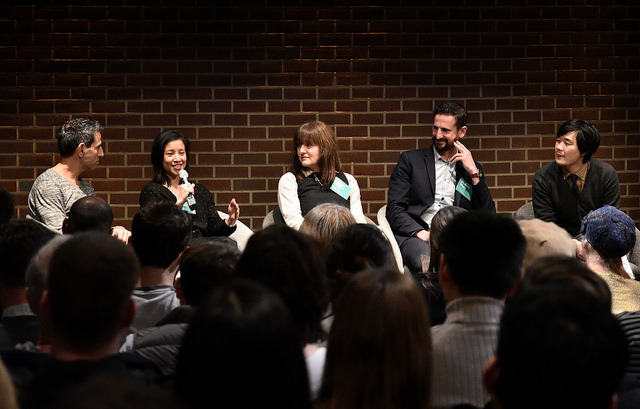 The City of Vancouver has been pretty patient with developers, and that is a perspective that we need to bring to more processes throughout the city. We acknowledge the financial assistance of the Province of British Columbia. Thank you to SFU’s Vancity Office of Community Engagement for co-presenting the series. All photo credits go to roaming-the-planet.